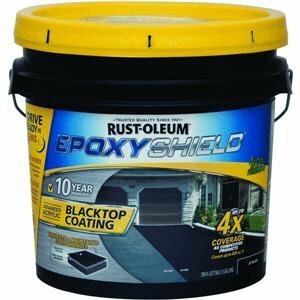 If you have been repairing or maintaining your driveway for a very long time now, then there is a high chance that you have used or come across the Rustoleum Epoxyshield blacktop sealer. Read this Rustoleum driveway sealer reviews to know more about this epoxy blacktop coating. Many homeowners and users consider Rustoleum to be a top driveway sealer because of its features and performance. After using different types of driveway sealers over the years, I can gladly say that I also like the Rustoleum blacktop sealer. Unlike other types of sealers, Rustoleum covers a wide area of up to 800 square feet. The sealer is formulated with recycled rubber tires and it is very easy to apply. It just goes on easily like paint and cleans up seamlessly with soap and water. After applying the sealer, it dries within 4 hours for foot use and 24 hours for car use. Using this sealer will enable you to apply less and save more as just one-gallon bucket of the EpoxyShield blacktop sealer is equal to two 5 gallon buckets of conventional asphalt coating. During application, the sealer will not affect the user a great deal as it has a low-odor coating. With its special formula, the coating will leave a lasting impression on your driveway. The black finish will beautify it and make it look even more appealing. Using this formula will help your driveway to resist chemicals, grease, UV rays, gasoline, and other elements from damaging your pavement. Apart from the exceptional features, the manufacturer offers users a 10-year warranty. Properly clean and degrease the whole driveway. Use the right cleaners to degrease and get rid of oils on the surface using primers. Trim any surrounding grass. Growth on the driveway is one of the elements that lead to quick deterioration. Ensure that all the grass that hangs or is on the driveway is trimmed or uprooted. Dig out debris from cracks and holes. No debris should be left in the cracks or fillers as it may cause the sealer not to adhere to the surface. Rinse the driveway with water and allow it to dry. Ensure that the driveway is properly rinsed a few days before applying the sealer. Pay attention in areas with cracks and holes. If possible, the kids should not play on the driveway a day before sealing it. Why buy this Rustoleum Driveway Sealer? The driveway sealer covers up to 800 sq. ft. The Epoxyshield blacktop driveway sealer offers amazing features and it is very durable. Unlike many other blacktop sealers, this coating covers a wider area and it offers many years of use. Just a small coat is enough and will last for many years. It is also easy to stir and has an advanced formula gel with recycled rubber tires. With a first drying formula, this is a reliable and quality sealer that will allow you to use your driveway just after one day of application. Q. Why is my sealer failing? Ans. If you seal on substances like oil, grease, dirt, or on oxidized surfaces, the sealer will fail and not bond well. That’s why you need to clean the area where you intend to apply the sealer well. If it is an area will oil spots, you need to treat it with an oil spot timer and if it is an oxidized surface, prime it with a thin coat of the sealer primer. Q. Why does my sealer wear out quickly in the entrance, exit, and traffic lanes? Ans. The first reason for wearing out quickly is due to the high traffic in the area. Other reasons for wearing out could be because of adhesion. The surface in this area aggregates over the years. Since the surface may be rough, it is a good idea to use a special primer in such areas to allow proper bonding of the sealer. Q. Why is my sealer turning to dry gray after applying? Ans. When the sealer dries below the recommended temperatures, it will turn to gray color as it dries. This includes in cooler temperatures, shaded places or high humidity places. But usually, the graying is only temporary as the full sun will cure it back to its normal black color. Also, you can get rid of the temporary gray by use of peculiar additives that help in the drying of the sealer. 1.2 Why buy this Rustoleum Driveway Sealer?